Wine, Women, and Wellness event educates on health while raising funds and awareness for Big Brothers Big Sisters. The Chiropractic Doctors, in association with The Wellness Champions of Grand Rapids, are hosting an evening of education, awareness, and wine samplings in an event to remember. 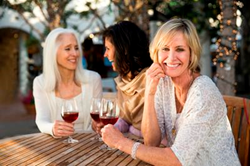 The Wine, Women, and Wellness event is open to anyone looking to learn more about health, wellness, and improving social relationships to help reduce stress. The complimentary event is scheduled for Thursday, March 3, 2016, at 6:30-8:30pm at the offices of The Chiropractic Doctors. Wine, Women, and Wellness will feature wines and food catered by Russo's, and will include multiple, short wellness presentations from local experts. The four presenters for the evening will focus their conversation-starter talks around the topic of “Why women helping women is important,” a topic inspired by the scientific findings of Joan Silk and her studies on how social relationships can influence a woman's ability to cope with the stresses of daily life. In addition to opportunity for attendees to make donations to the charity, Wine, Women, and Wellness will offer discounted health packages from The Chiropractic Doctors available for purchase, with all proceeds going to support Big Brothers Big Sisters.